The First Judicial District Commission on Judicial Performance unanimously recommends that Judge Ryan J. Stuart BE RETAINED. Judge Stuart was appointed to the Jefferson County Court in August, 2012. His immediately preceding position was as District Court Magistrate for the First Judicial District, Jefferson County. 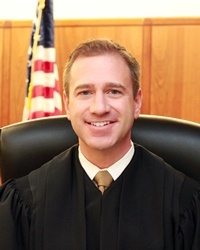 Judge Stuart received his undergraduate degree from Stanford University, a Master’s degree in Education from Harvard University and his law degree from Georgetown University Law Center. Since his appointment, Judge Stuart has participated in a national program focused on handling domestic violence cases, as well as other appropriate continuing education programs. He has continued to involve himself in community service activities such as support for school/parent organizations and high school mock trial competitions. Of attorneys responding to a survey sent to attorneys and non-attorneys, 79% recommended Judge Stuart be retained, 12% not to retain, and 9% made no recommendation regarding retention. Among non-attorneys responding to the survey, 90% recommended to retain, 6% not to retain, and 3% made no recommendation regarding retention. Survey results among attorneys and non-attorneys who have appeared before Judge Stuart graded him as above the average for county judges being evaluated during this retention cycle. Judge Stuart is graded particularly high in overall demeanor, treating those before him with respect and bringing dignity to the court. Yet, the grading process reflects a perception of prosecution bias. This perception concerns Judge Stuart. In his interview with the Commission Judge Stuart pledged to address this perception in his effort to allow every person who comes before him in his courtroom to feel treated fairly. Judge Stuart has received high marks overall for his performance. He is a positive new addition to the Jefferson County Court. He recognizes and pledges to address the perception of prosecution bias reflected in the surveys. Based on these findings, the Commission unanimously recommends that Judge Stuart BE RETAINED.